The Siam Society Hotel is a Bangkok boutique hotel that's distinctly Thai, a resort that's memorable for its art, beauty, luxurious comfort and sheer originality. This boutique hotel is located in the quiet Soi Yothin Patana, off Pradit Manutham Road, Bangkapi just north of the busy Lat Phrao Road. It's the last place you'd expect to find a hotel, let alone a boutique hotel. 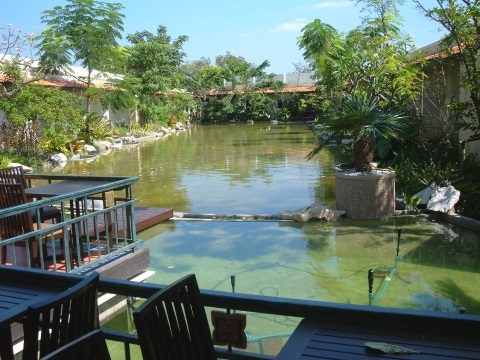 The main hotel building and lobby overlook an open restaurant patio by a large pond surrounded with a beautifully landscaped garden. The rooms are arranged in a horseshoe around the pond lined with lush greenery, providing each room with a view. With just 43 rooms, the hotel is small, cozy and very private. Meticulous care is paid to comfort and luxury. Each room is exquisitely furnished and fitted with wood flooring, wall panels, a jacuzzi and a private porch. The décor is a blend of timber and stone. Murals and paintings by aspiring Thai artists reflect the theme of each room, which is distinctly Thai. These theme rooms give the Siam Society Hotel its unique stamp. The boat room has a bed in a traditional boat moored at a pier in an actual pond! Mind your step and don't fall in. However, the boat's stabilized and you are assured of a sound sleep. Safety boards have been installed to make sure you don't roll over into the water. 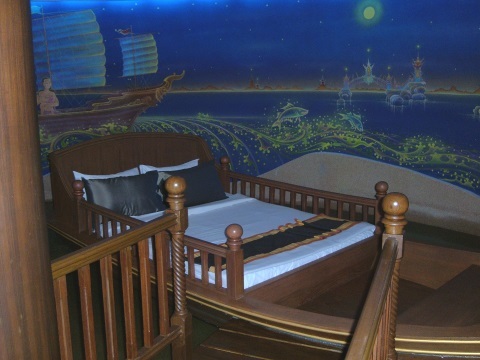 Motifs of river life on the walls create an illusion of flowing water to set you drifting off on your pleasant dreams. For those who fancy a scuffle before bed, there's the Muay Thai room with a bed in a life-sized Thai kick-boxing ring, complete with real boxing gloves, bell, punching bag and murals of Thai boxers. You have to climb into the ring to go to bed! No referees are provided. 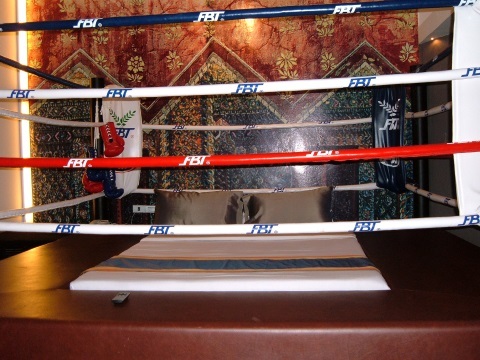 Fancy a bout before bed? 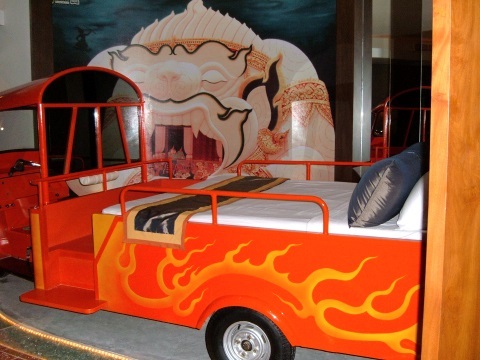 Still want more adventure, then try the bed on a modified fiery red "tuk tuk", the ubiquitous three-wheeler plying the Bangkok roads. I was told this "tuk tuk" actually works, so make sure no one drives off while you're asleep. 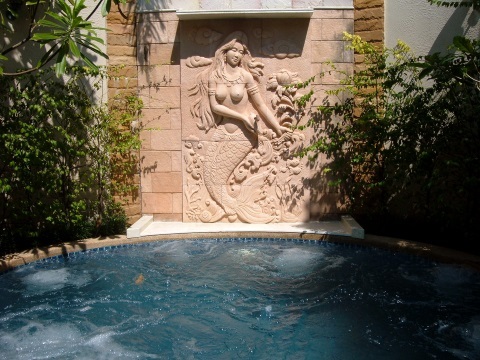 If you prefer something more subdued, the room with an attached private walled-in swimming pool and mini waterfall puts you in a world of your own. The peaceful little poolside garden is ideal for drinks at sunset. Care to have a taste of living in grand style? Spoil yourself at the luxurious Siam Suite with its indoor pond and waterfall, sauna room and private outdoor swimming area. A wooden step bridge spans the pond separating the bedroom/living area from the sauna/jacuzzi area. 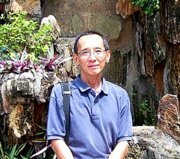 Of course, conventional rooms are available at the Siam Society Hotel for those who prefer something more down to earth, affordable but equally comfortable. Opened in October 2005, the Siam Society Hotel is a Bangkok boutique hotel with comfort, luxury, an air of warmth and a homely atmosphere provided by a friendly staff. Though a little off the beaten track, it's a fantasy getaway! For more conventional Bangkok hotels and for more unforgettable Bangkok photographs.